Latest Government job Applications are invited for the subsequent posts on promotion/ deputation basis. Check the table below for more information related to this Ministry of Finance recruitment process 2019. UPHESC Recruitment department introduces an official employment notification for filling up the vacant positions of Principal job profile in various Schools. Good opportunity for postgraduate candidates to apply for these UP Govt Jobs 2019. More information related to this recruitment process has explained below in this article. NIOS Recruitment for Jr. Assistants, Supervisors and Other Posts. All fresher candidates can apply for these two job profiles of Assistant and Supervisor posts. Remaining job profiles other than these twos required experience. More information about these Government jobs is given below in this article. Read it carefully before applying online. EIL stands for “Engineers India Limited”, a Navratna Public Sector Undertaking by Government of India and an Engineering Consultancy Corporation. EIL Recruitment department is looking for active experts with a desire for brilliance and the ambition to partner in the Nation’s Development story. 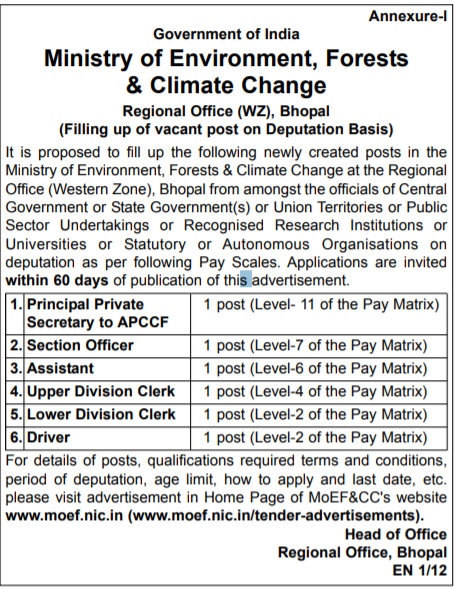 It is proposed to fill up the following newly created posts in the Ministry of Environment, Forests & Climate Change at the Regional Office (Western Zone), Bhopal from amongst the officials of Central Government or State Government(s) or Union Territories or Public Sector Undertakings or Recognised Research Institutions or Universities or Statutory or Autonomous Organisations on deputation as per following Pay Scales. Applications are invited within 60 days of publication of this advertisement. For details of posts, qualifications required terms and conditions, period of deputation, age limit, how to apply and last date, etc. 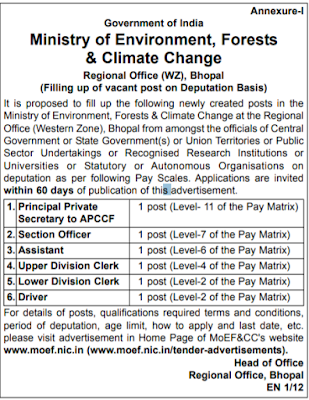 please visit advertisement in Home Page of MoEF&CC's website www.moef.nic.in (www.moef.nic.in/tender-advertisements). Process for Applying: You have to apply OFFLINE for this recruitment process. With in the 60 Day of Publication in Employment News. 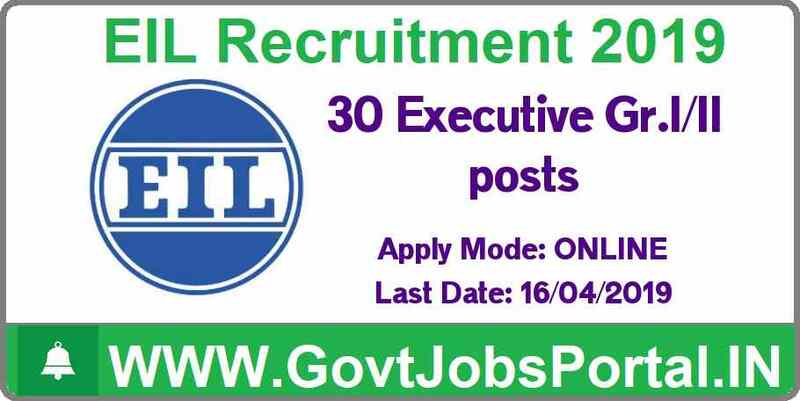 Engineers India Limited recruitment for 30 executives Posts. EIL (Engineers India Limited), is an organization under Navratna Public Sector Undertaking by Government of India. 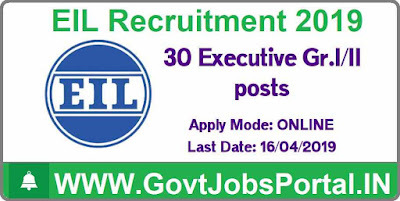 EIL is an Engineering Consultancy Company which is currently looking for energetic persons with a desire for brilliance and the determination to partner in the Country’s Growth. 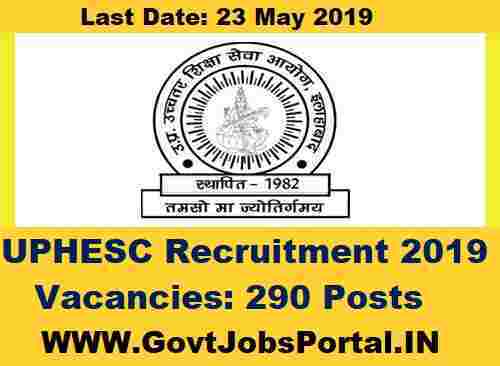 Government jobs for mechanical engineers 2019. The EIL Corporation over the past 50 years has accomplished some of India’s major schemes in refineries, petrochemicals, pipelines, offshore, metallurgy, infrastructure & fertilizer sectors. The EIL Corporation has embarked on the development plan into sunrise sectors such as Nuclear, Solar, Water & Waste Management and is increasing its international presence in over 13 countries world-wide. Currently EIL Recruitment department is looking for appropriately capable, skilled and interested persons in the following disciplines on FIXED TERM BASIS. 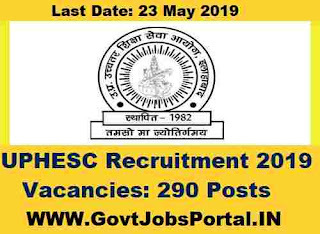 Check the post below for more information related to this Engineers India Limited recruitment 2019. Government jobs for mechanical engineers. Syndicate Bank recruitment for officer posts. There are total 129 vacancies which are going to be filled up after the completion of this bank recruitment process. SYNDICATE BANK , is one of the leading Public Sector Bank in India. Bank invites all Indian Citizens for the employment of Specialist Officers in various verticals/Scales. 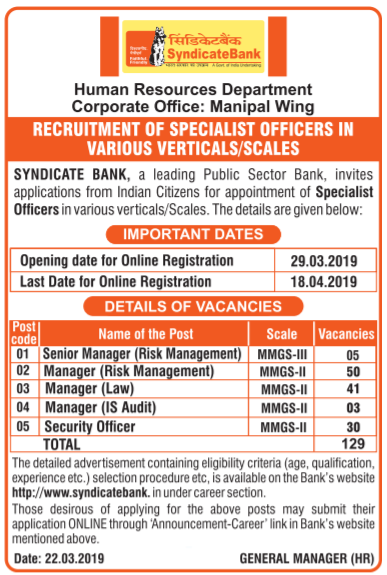 The details are given below related to this Syndicate bank recruitment 2019. More Detail: The detailed advertisement containing eligibility criteria (age , qualification , experience etc.) selection procedure etc , is available on the Bank's website http://www.syndicatebank.in under career section. Those desirous of applying for the above posts may submit their application ONLINE through 'Announcement-Career ' link in Bank' s website mentioned above. 29TH March 2019 is the Start Date to Apply. 18th April 2019 is the Last Date to apply. 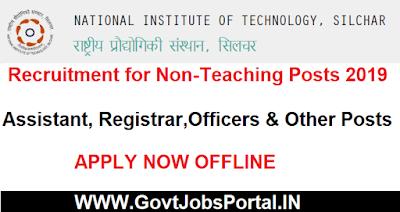 NIT Recruitment for various Non-Teaching posts 2019. 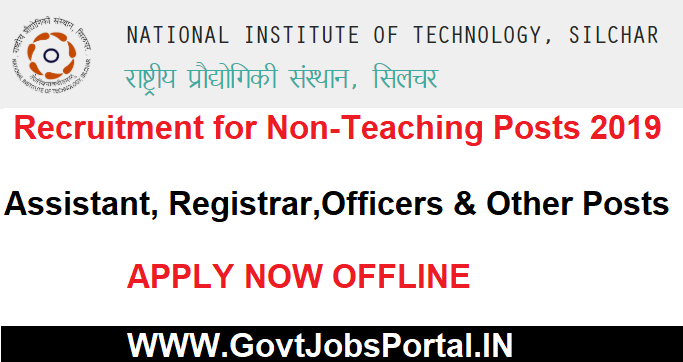 NIT (National Institute of Technology) Silchar is inviting online job applications in a prescribed format from Indian Nationals holding consistently good academic record and requisite qualifications and experience for the following posts. We explained the complete detail related to this NIT Recruitment process below. 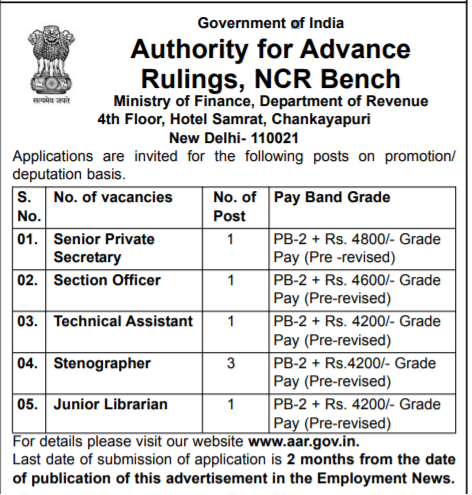 The North Eastern Council Secretariat is looking for the services of suitable officers for filling up the posts of (1) 01 (one) post of Draftsman Grade I and (2) 17 (seventeen) posts Stenographer Grade II on deputation basis. The details of the posts, eligibility criteria, job requirement and experience required for the posts are indicated below in this article. The pay and other terms and conditions of deputation will be regulated in accordance with DoPT O.M. No. 6/8/2009-Estt. (Pay-II) dated 17.06.2010 as amended from time to time. Cadre authorities/ Heads of Departments are invited to forward the job applications and should be reached the undersigned within 60 days from the date of publication of this advertisement in the Employment News. The Employment Newspaper Date of Publication is 30th March to 5TH April Edition. List of Enclosures to be Accompanied with the Application/certificates to be given by the office/Department while forwarding the Application. Scale of pay : Rs. 4500-125-7000/- (5th CPC)/PB-1 Rs. 5200 20200/- plus Grade Pay of Rs. 2800/-(6th CPC) corresponding to Level 5 of the Pay Matrix as per 7th CPC. Method of Recruitment: By deputation. Eligibility Criteria: Officers under the Central or State or Union Territories Eligibility Criteria Government holding analogous post or post in the lower grade, in the same grade in the scale of Rs. 4000-6000 (5th CPC)/PB-1 Rs. 5,200-20,200/- + GP Rs. 2400/- (6th CPC) corresponding to pay scale of Rs. 25500 - 81100/- (Level 4) of the 7th CPC Pay Matrix with five years' regular service in the grade. Scale of pay : Rs. 5000-150-8000/- (5th CPC)/PB-2 Rs. 9300-34800/- plus Grade Pay of Rs. 4600/-(6th CPC) corresponding to pay scale of Rs. 44900 - 142400/- (Level 7) of the 7th CPC Pay Matrix. 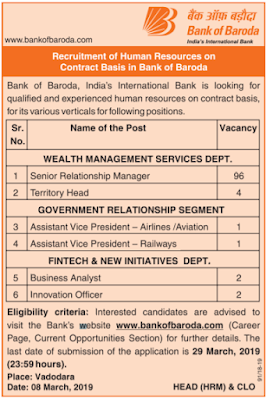 Bank of Baroda , India 's International Bank is looking for qualified and experienced human resources on contract basis, for its various verticals for following positions. 1. An applicant can apply for only one post under this BOB Recruitment 2019. 2. The procedure of Registering of application is complete only when the application fee is deposited with the Bank through On-line mode on or before the end date for fee payment. 3. Before applying, applicants must confirm that they fulfil the suitability standards for the post as on the date of eligibility. Short-listing and interview will be purely temporary without verification of documents. Application will be subject to verification of details/documents when the applicant reports for interview if called from the bank. 4. Applicants are recommended to check Bank’s website www.bankofbaroda.co.in/careers.htm regularly for details and updates. Call letters/advices, where required will be sent by e-mail only. FINTECH & NEW INITIATIVES DEPT. Education: Indian Graduates from Government recognized University or Institution. Preference will be given to applicants having MBA or equivalent degree from reputed Colleges. · The candidate should have adequate experience in building and managing relationship with High Net Worth Clients. Interested candidates are advised to visit the Bank's website www.bankofbaroda .com (Career Page, Current Opportunities Section) for further details. The last date of submission of the application is 29 March, 2019. 2. ‘Rs.100/- (Intimation charges only) for SC/ ST/PWD candidates. Bank of Baroda is not answerable if any of the applicants makes more than one payments. SELECTION PROCEDURE: Selection will be based on short listing and/or Written Test and /or Personal Interview and / or Group Discussion. · Bank of Baroda reserves the right to change (cancel/ modify/ add) any of the selection criteria, method of selection and provisional allotment etc. · The Bank recruitment department reserves all the right to call for the Written Test / GD/ PI, candidates in a ratio, at its sole discretion. · Acceptable applicants as decided by the Bank will be shortlisted based on their qualification, experience and overall suitability for the selection procedure. · The succeeding marks, and its weightage in Written Test and /or Personal Interview and / or Group Discussion will be as decided by the Bank. · An applicant should succeed in all the procedures of selection, i.e. Written Test and /or Personal Interview and / or Group Discussion (as the case may be) and sufficiently high in the merit to be shortlisted for subsequent allotment procedure. · In case more than one contender scores the cut off marks (common mark at cut off point), such applicants will be ranked according to their age in descending order. NOTE: BOB published this Notice in “The Time of India” newspaper published on 13th March 2019. We had took the complete information from that Notice and shared with you readers. When the eligibility criteria and other conditions Notification is out on the official website we will share with you here under IMPORTANT LINK section. So book mark this page and check again after few Hours. 29TH March 2019 is the Last Date to Apply.